I did not even knew it was possible but on the VMTN Community Forums user PatrickD revealed a workaround to set a different block size for your local VMFS. Of course the question remains why you would want to do this and not create a dedicated VMFS for your Service Console and one for your VMs. Anyway, it’s most definitely a great work around thanks Patrick for sharing this. There isn’t an easy way of doing that right now. Given that a number of people have asked for it we’re looking at adding it in future versions. edit the “blockSizeMB” parameter to the block size that you want. it will currently be set to ‘1’. the only values that will probably work are 1, 2, 4, and 8. After that, run through the installer as you normally would. To check that it worked, after the installer has completed you can go back to a different terminal (try Ctl-Alt-F3 since weasel is now running on tty2) and look through /var/log/weasel.log for the vmfstools creation command. 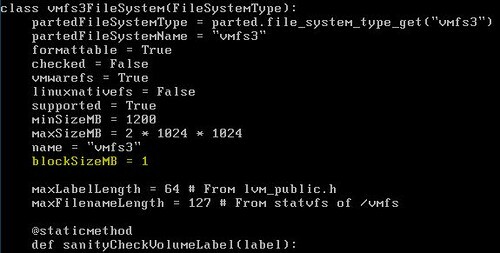 If you have the ability to physically move your disk (and controller) to a machine with an existing “scratch install” of ESX, you can build the VMFS file system with the large block size on it. Then move the disk/controller setup to its intended server and then perform the install. The install should respect the existing VMFS (and retain the larger block size). I recently configured a small text box this with with ESXi on USB and a 1TB SATA. Great info! I was wondering where this might have been hard coded within the installer. You actually gave me an idea on how one might be able to change the default block size via kickstart but unfortunately we were not able to test since we had some issues in our build environment. Another method of changing the blocksize is posted on my blog. It comes down to first installing an extra partition as empty vmfs datastore and then reformat it using vmkfstools. I am not an IT pro. I dont know anything about linux. I would like to know if I do this right. Please be excuse this is a noob question. I boot the ESX4 install DVD. Then I choose graphical mode. I waited until the first GUI screen which let me click next. I press Alt Ctrl F2 to enter console. I input ps | grep Xorg and get “496 root 88608 S /usr/bin/Xorg -logfile /tmp/X.log :1 vt6 -config /tmp”. So I input kill 496. I vi the file and it got a [readonly] tag. I am not able to save the file when I done editing. Please let me know what part i am doing wrong. Thanks for your time. The best solution is to create two virtual disks on your RAID card. They can be in the same RAID group if needed. Make the first one 15GB and the second can consume the rest of the available space of the RAID. Then install ESX 4 on the first 15GB virtual disk (VD / LUN). Once the install is complete and you have VIC or VCenter connected, add new storage datastore and use the 2nd VD, format it with VMFS and blocksize of your liking (Usually 4MB or 8MB). The other beauty to this is that you can always reinstall ESX 4 anytime without disrupting your datastore with the VMs. I tried what you recommend. But after installing esx4 I can’t create e second one by VI Client. Just thought this might help someone. fsset.py, readonly.. didn’t get a chance to get around that. Could not find Xorg in the ps list. My solution was to wipe the raid config and create 2 virtual disks..
Other option was to install ESX on a USB stick (internal slot on Dell r710s) however I need the service console and that requires minimum 9.2GBs which i didn’t have on USB. Thanks! This step-by-step where really helpful for us! is that also possible with the ESXi 4.0 Server Version or only with ESX 4.0? I see that VMware has posted about this as well including how to deal with the read-only file. I had the task of setting up ESX 4 for a client recently, and I found the posts here very helpful. I am an MCT MCSE etc. but new to Linux and ESX. I found that the setps here, though correct, were not detailed enough to start from scratch. So I did have to do some extra searching. Basically I got the ESX server setup and virtualised one Server and a second is planned. I installed the server with the defaults first. This was fine for the testing I did, and virtualising the test server. However when I went to virtualise my clients server, I was told the block size was too small. Searching led me here, and I am greatful to all the contributions found here. The RAID was already setup by a colligue, one big drive, (Not Ideal and I’ll do it differently next time). 😡 would normally save a file, but this file is read only, so you need to force a save. I hope this helps someone else who is new to this. I did a little panicing and alot of searching/learning, but thanks again guys for all the help!